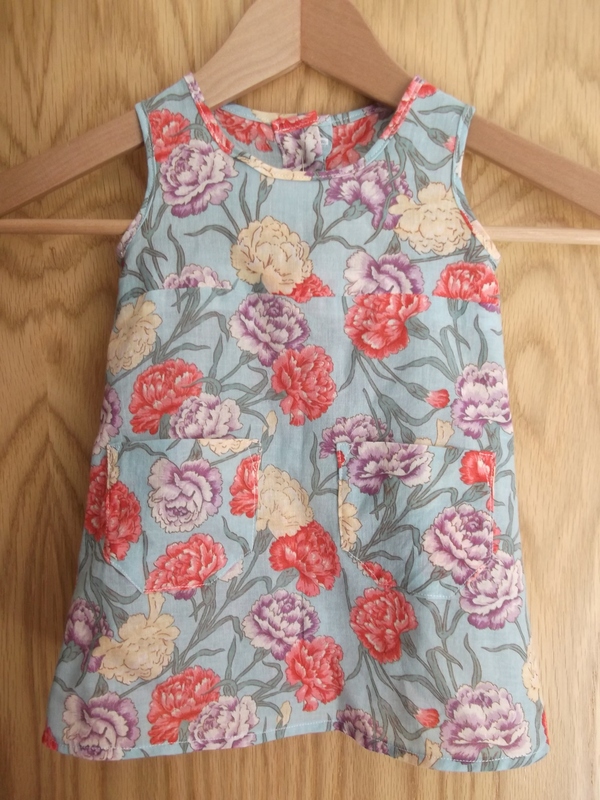 I have made TEN versions of this dress since June 2010, so it is high time I wrote a review of the pattern. I will incorporate photographs of all the versions I’ve made for you to see – expect for a grey needlecord version which unfortunately I don’t have a photo of, and it’s now packed away in the loft! The pattern doesn’t really have a description other than that it is ‘fitted’. 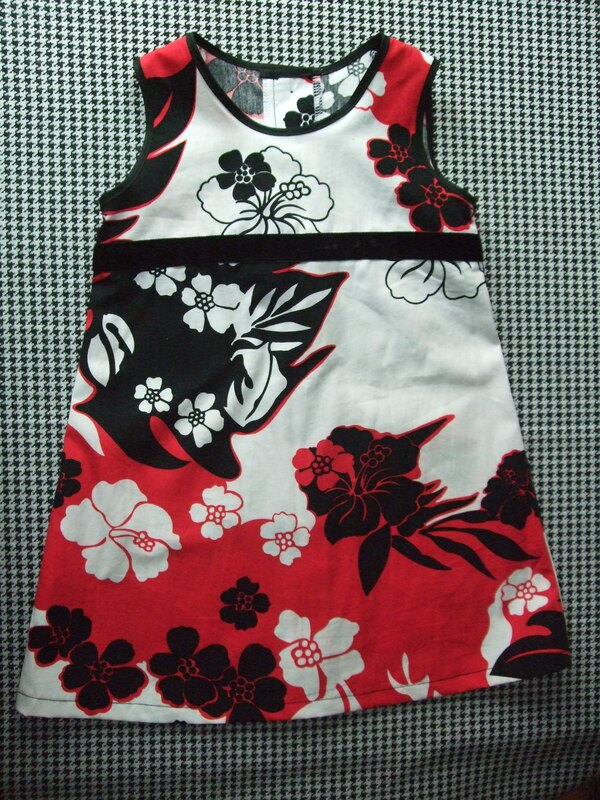 It’s a basic dress with bias bound armholes and neckline and button fastening at the back. It has options for patch pockets and trim. Yes, all the dresses looked as pictured on the envelope. The instructions are very easy to follow. 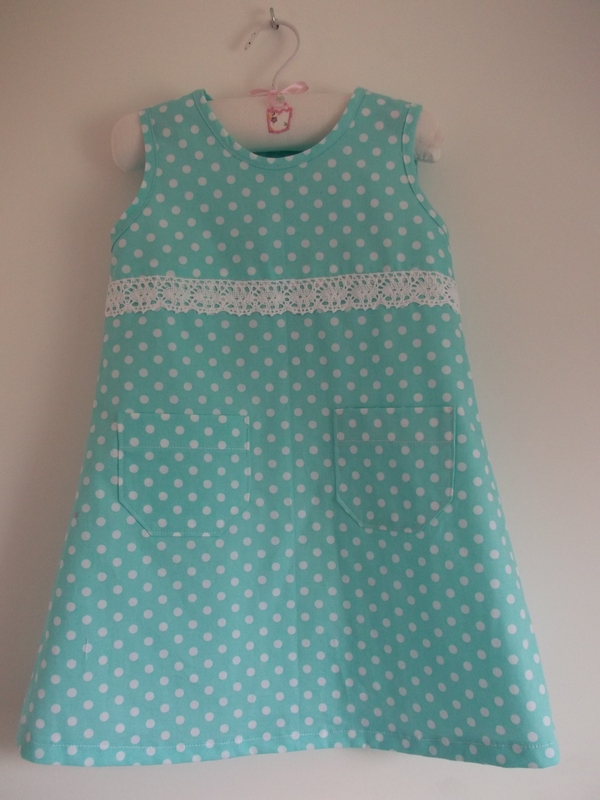 This is a very simple dress to make. I just love how quick and easy this pattern is to make up. 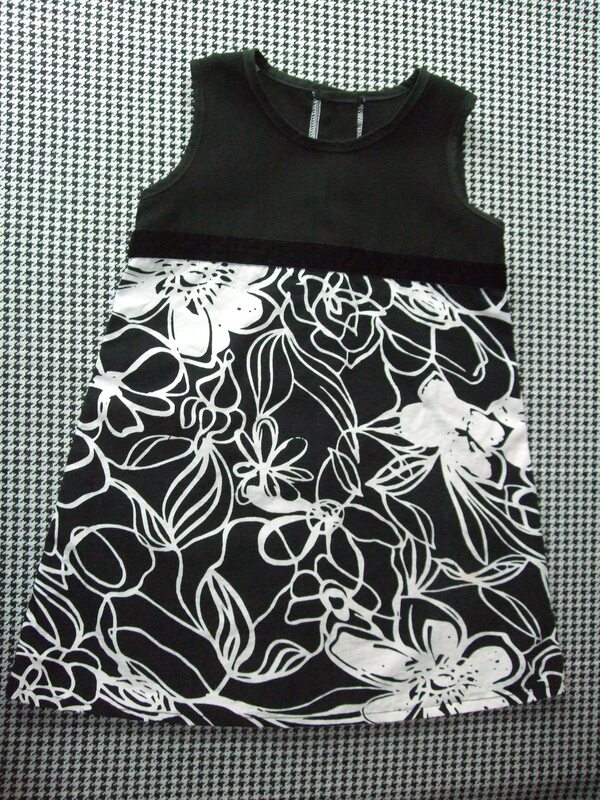 For a 6 month dress I found you only need 55cm of fabric (even though it says 65cm on the envelope) so it’s perfect for using up leftovers, or fabric taken from pre-existing clothing (my Hawaiian print version used to be a skirt, and the black and white version pictured below used to be a dress). As a Mum I have found it practical and hard-wearing, and most importantly easy to put on and take off. 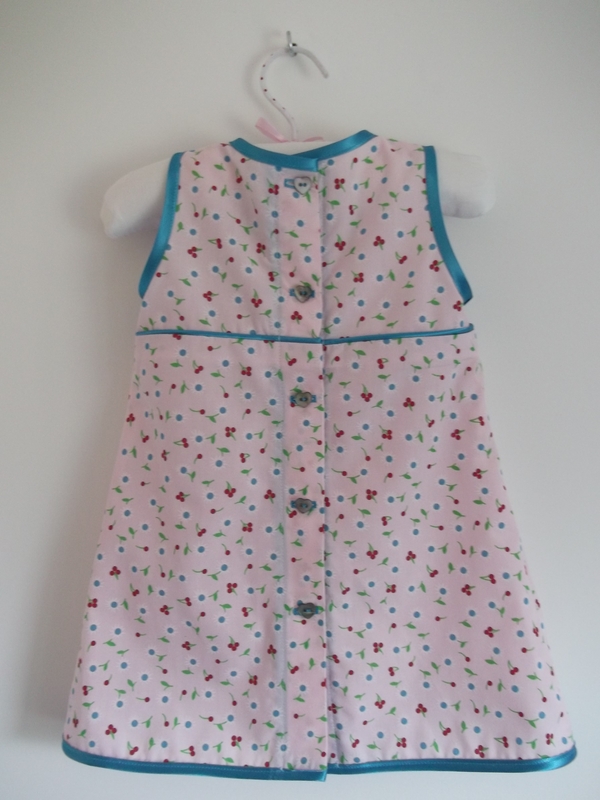 I’ve used mainly cottons for this dress, but I think it would work well in just about any fabric. 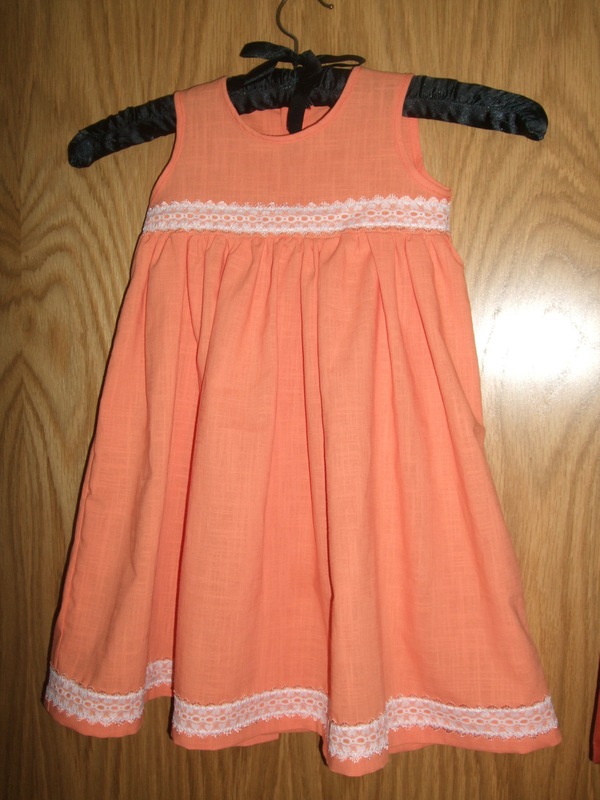 The fabric recommendations on the pattern are cotton fabrics, lightweight denims and linen. When I’ve had limited fabric I’ve used ready-made bias binding for the armholes and neck, and contrasting fabric for the bodice pieces. 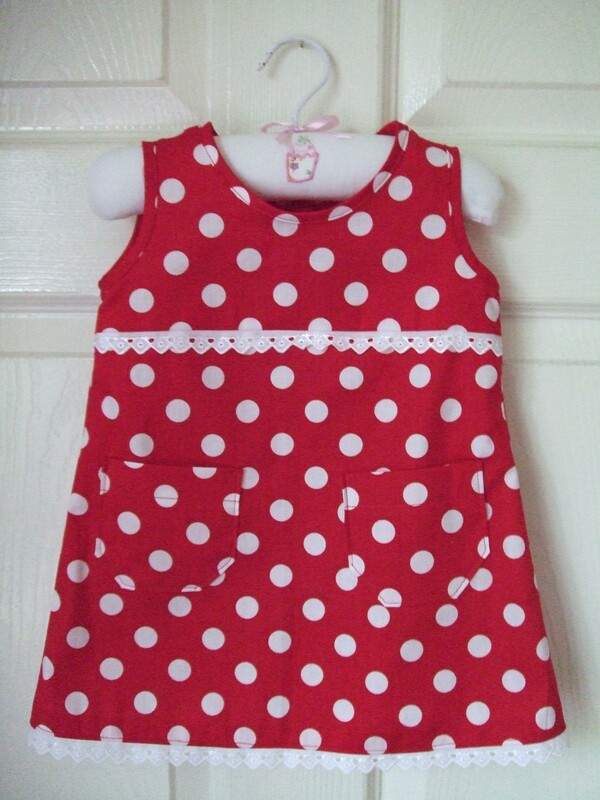 For my cherry print version (pictured last) I used bias binding to create piping along the bottom of the bodice and used it to finish the raw edges too. I also used the bodice pieces of this pattern as a guide to help me draft a fully gathered, longer skirt version. 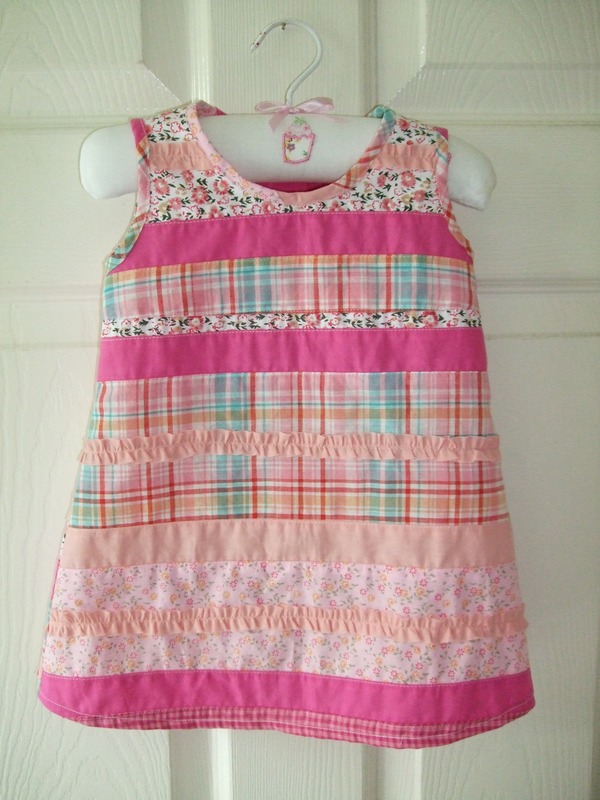 I sew this pattern regularly for my daughter and to give as gifts to new babies. I wouldn’t be without it. I love this pattern. It’s quick, easy, cheap, versatile and practical. What more could I ask for?! 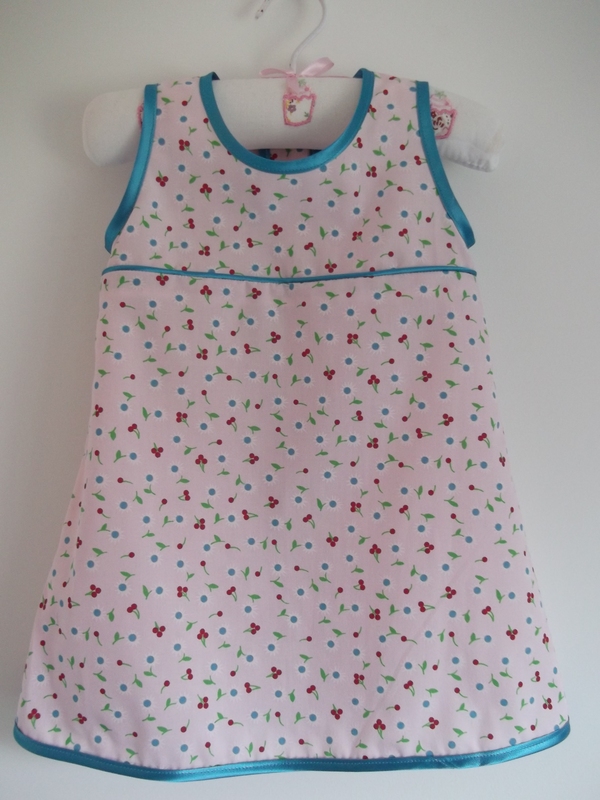 I have other patterns for baby dresses which are untouched because I find this one so easy to make again and again. Hiya! The instructions tell you how to add ribbon trim to the bodice/skirt seam and to the hem, but not specifically how to add piping. I just used piping cord and pre-made bias binding to make the piping, and then sewed it in along the seamline. I’m sure it’s well within the realms of your capabilities! I’d definitely recommend the pattern if you can find it – I bought it only last year from John Lewis, think it only cost about a fiver and it goes up to age 3 so if you trace out the pattern in different sizes you can use it again and again! Hi, the bit that is interfaced is the strip that folds inwards at the centre back, where your buttons and button holes go. So yes, you do need to cut the strip for the bodice and the skirt to reinforce the button fastening. Hope that helps.